Selling is all about addressing your customers’ needs. Whether it’s offline or online, you seek to get to know your client segments and offer them what they’re looking for. However, there are several things all consumers have in common. It’s a human thing that we like when things go quickly and effortlessly. Fortunately, thanks to the Internet, we can shop the way we like: saving our time and effort. But is it enough to let your customers buy online? Can you still make their shopping experience less absorbing – and your brand more competitive as a bonus? Let’s take a look at the transaction costs. What are they? And why is it worth slashing them? What variables shape the transaction cost? Transaction cost is an integral part of every product or service purchase process. It is the total financial and non-financial cost apart from the product’s or service’s price one must pay in order to undertake a transaction or make use of its result. To cut a long story short, it is everything but price we pay before and after the purchase, be it money, time or effort. Transaction costs are covered by both merchants and their customers. The seller has to pay legal fees, taxes, communication charges, infrastructure expenses, and so on. These vary depending on the type of online business, technical and legal requirements a merchant operates under etc. and usually are stitched in the price. Therefore, in this short entry, I’m focusing on the transaction costs carried by customers, as those influence your competitiveness directly yet are seldom included in merchant balance sheets. 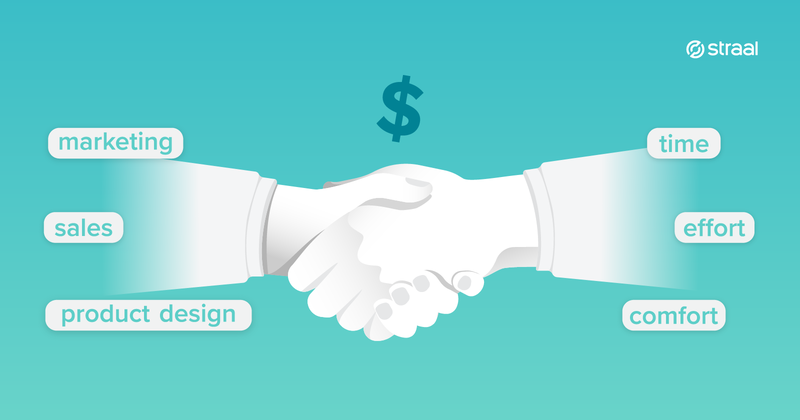 the cost of learning the seller’s platform and adjusting the product/service to the customer’s needs (UX). These non-financial costs translate mainly into the time and effort your customer has to pay to purchase and use your merchandise. For instance, if your company offers SaaS products, your customer has to invest their time to find information about your company, find the best-matching pricing plan on your website, carry out payment and then put effort into learning how to navigate your platform and use the software. 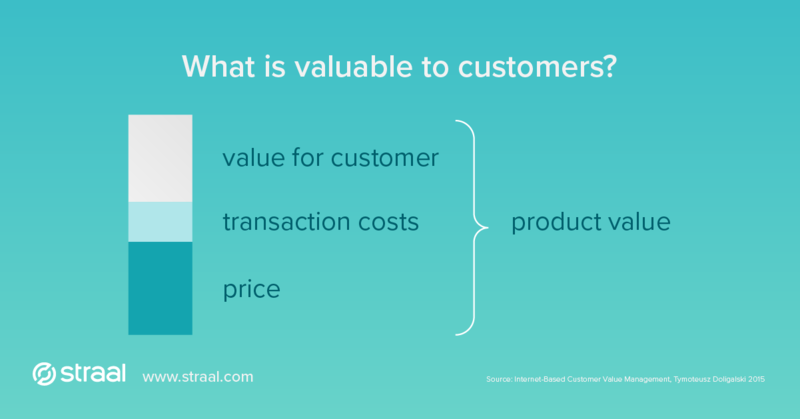 As you can see, non-financial costs are often invisible for the customer until they make a purchase but might noticeably affect their post-purchase actions – extremely important in the face of the VaaS economy where customer retention is paramount. Speaking of retention, transaction costs are also connected with the, so-called, switching costs: the “price” your customer would have to pay in order to switch to one of your competitors. It might be financial (e.g. account activation cost), but – again – is usually non-financial and associated with learning how to make the most of the product/service and the means to use it. High switching costs are beneficial for merchants as they facilitate customer retention: when predicting a time-consuming switching process, clients become more willing to stick to their current service providers. This is known as the lock-in effect or vendor lock-in. Why should you cut your customer’s transaction costs? Customers can easily compare digital goods available on the market as well as their prices. Consequently, differentiating your brand is more challenging than ever and the price war changes into the customer convenience war. Furthermore, once you’ve managed to gain a client, you should find a way to retain them over time. It’s worth remembering that attracting a new customer is even five times as costly as retaining an existing one. take advantage of the lock-in effect. How to cut customer’s transaction costs in your online business? make transactions easier: provide your clients with a truly frictionless purchase process – eliminate redundant waiting time, reduce the number of the checkout process steps and save your customers from entering innumerable items of data; take advantage of the best fintech can offer, fitting your online store with modern payment methods (e.g. convenient one-click payments) and an efficient payment gateway; consider switching to a subscription-based revenue model, too. As I mentioned in one of my previous blog posts, even a two-second delay is likely to increase cart abandonment rate up to 87%, decreasing the conversion rate dramatically. Reducing the time of the transaction itself is a very simple yet powerful method of cutting customer’s transaction costs. Reducing the non-financial transaction costs of your customers is relatively simple and, simultaneously, very rewarding. What you receive in this exchange is your customers’ loyalty and trust accompanied by a special position of your offer on the market – and all that just for saving your customers’ time and effort. Remember that good news spreads quickly so you’ll also get an extra bonus in the form of word-of-mouth marketing. Michał is an experienced executive who combines his deep technical background with outstanding business savviness. Prior to joining Straal, he had developed his managerial and analytical skills at a top tier consulting firm - The Boston Consulting Group - where he specialised in strategic advisory for the financial services sector. At Straal, Michał is responsible for creating and operationalizing the company’s go-to-market strategy, coordination of key business development projects and building fruitful relationships with all stakeholders. He holds a degree in Mechanical Engineering at Imperial College London.